Animal beanies have been floating around online for a while now and for good reason; they’re so cute! My cousin recently asked if I could make one for her son, and she had a few requirements. It had to be warm (obviously) and cover as much as possible. She also wanted it to be snug to his head to keep air out, unlike hooded scarves. Lastly, she wanted it to look cute, but not too feminine since it was for her son. 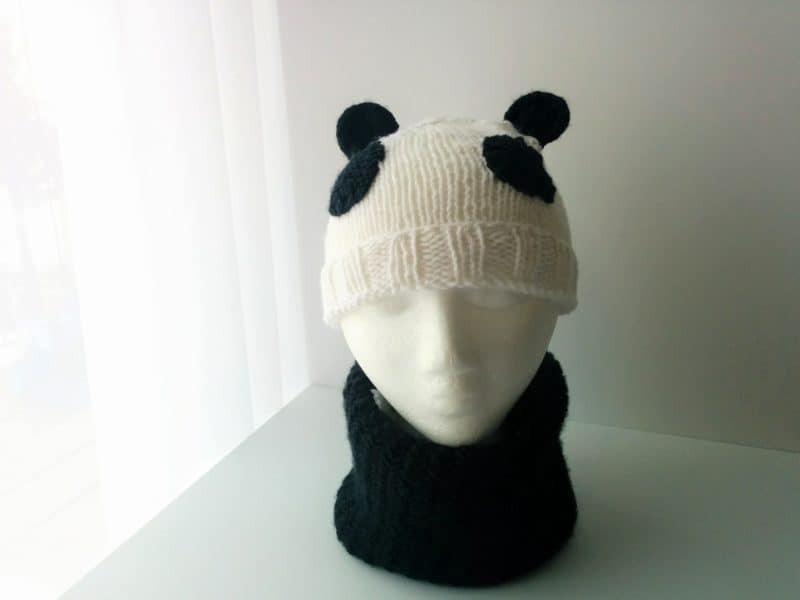 So, taking all those things into consideration, I came up with a kids’ panda beanie and cowl that I think fit the bill perfectly! Keep reading for the full pattern! This beanie is sized for kids about 2-5 years old. It’s made in a few pieces, then sewn altogether in the end; I did not attach the back of the cowl to the beanie for these pictures, but I did afterward because my cousin wanted it all to be one piece. First, I made the cowl. Next, I made the actual beanie in white yarn. These two things are simple and can be sized differently if you want to make it larger or smaller, but the pattern here is for ages 2-5. The last thing I did was create the features and sew them all on in the end. You can check out my Ultimate Guide to Sizing Hats if you need help with sizing. 1. With US 13 needles and black yarn, cast on 44 stitches. 2. K2tog through back loop, but slide only the first loop off the needle. This will count as another stitch and it will be worked again. K2tog tbl again, leaving one stitch on the left-hand needle. Continue all the way down the row. Knit the last stitch. Repeat rows 2 and 3 until the cowl measures 22 inches long. Bind off and sew the short sides of the piece together to form loop. And you’re done with the cowl! Next, let’s make the beanie. 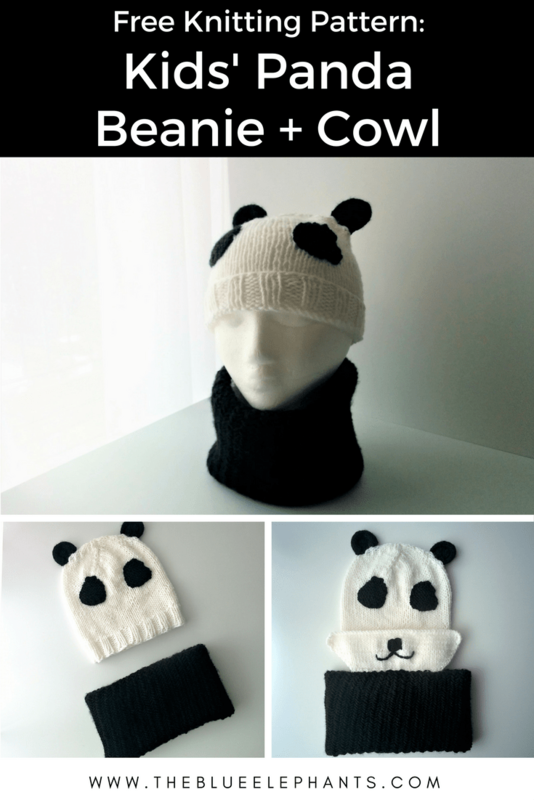 If you already have a favorite beanie pattern, you can use that if you like. This is just a simple pattern that will make up the base and we’ll add our panda features onto it later. I like this because the crown decreases in four sections making an X at the top. 1. With white yarn and US 8 needles, cast on 48 stitches. Join to work in the round, being careful not to twist the stitches. 2. *Knit 2, purl 2* all the way around. Place a marker to mark the beginning of the round (48 stitches). 3. Work in K2P2 ribbing until the cuff is 1.5 inches tall. 4. Switch to US 9 needles. Knit around (48 stitches). Continue in stockinette stitch (knitting every round) until the hat measures 7.5 inches from the cast on edge. 5. Knit the next round, placing a stitch marker after every 12 stitches to help track the decreases. 6. [sl 1, PSSO, knit 1, k2tog], knit to marker. Repeat this pattern 3 more times around the hat (40 stitches). Repeat rounds 6 and 7 until there are only 4 stitches between markers (12 stitches total). 8. K2tog around. Then, cut the yarn and thread the tail through a tapestry needle. Bring the tapestry needle through the 6 remaining stitches and pull to close the top of the hat. Secure the top with a knot, trim the yarn and weave in any loose ends. You’re done with the beanie part! 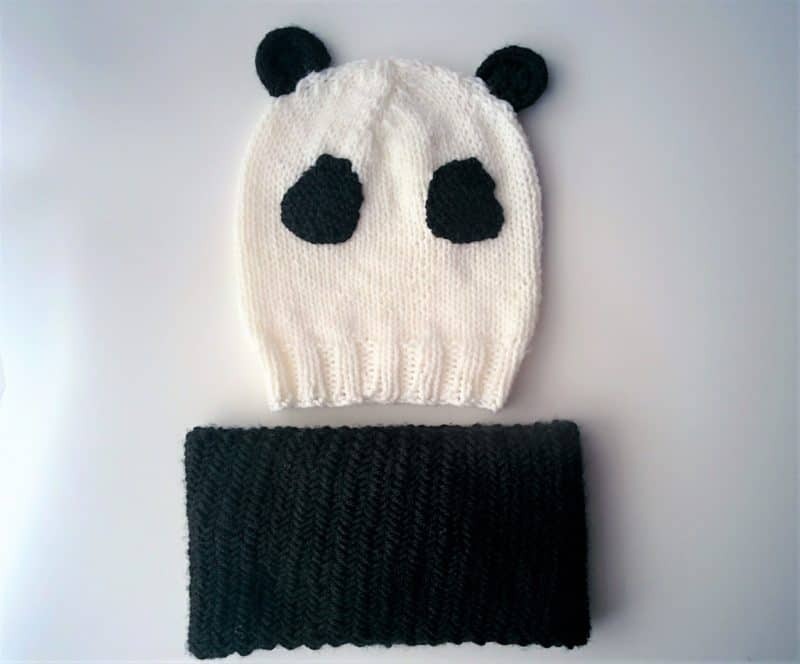 Now, let’s make this standard beanie into a kids’ panda beanie! 1. With US 8 needles and black yarn, cast on 6 stitches. Work in stockinette until you have a strip 2 inches long. Bind off. 2. Fold the strip in half and sew down the middle where the two edges meet. You should have a half circle shape that isn’t totally flat. It will have a ridge, like an ear. 1. With US 8 needles and black yarn, cast on 3 stitches (3). 5-8. Knit for 4 rows. 11. K2tog, knit 3, k2tog (5 stitches total). 12. K2tog, knit 1, k2tog (3 stitches total). 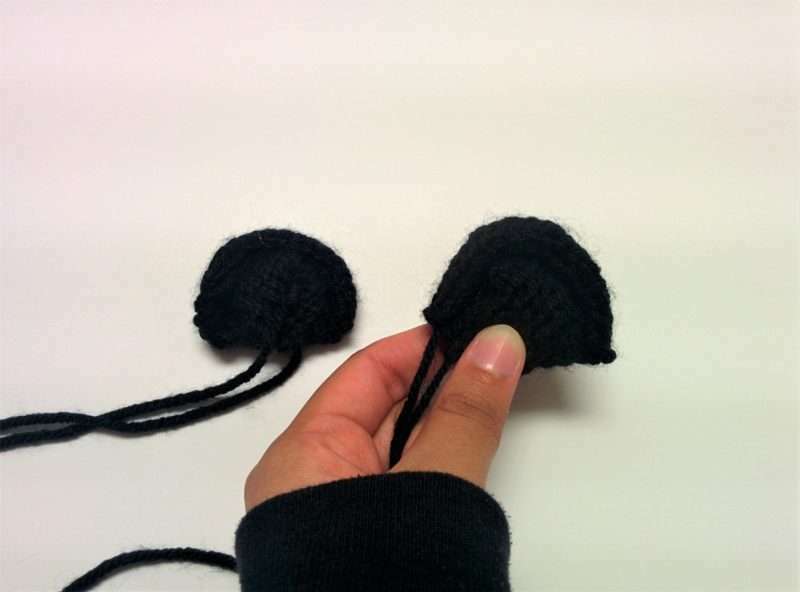 Bind off and leave a long tail for sewing onto beanie. This last part is optional. 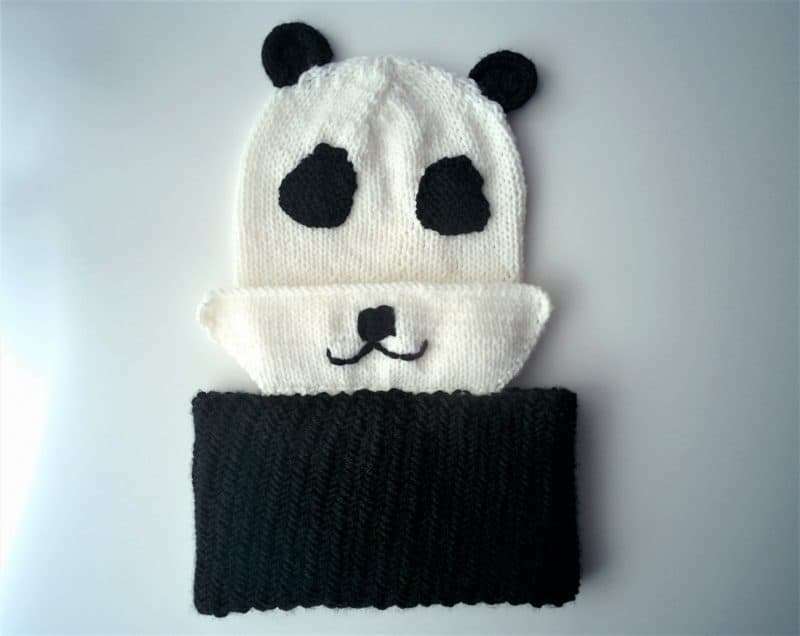 I added a mouth-covering area and embroidered it to look like a panda’s mouth and nose because it was the little extra warmth that my cousin asked for. However, it’s not necessary and the cowl can cover the mouth too. 1. With US 8 needles and white yarn, cast on 30 stitches. 2. KFB, knit to last stitch, KFB (32). Repeat rows 2 and 3 four more times until you have 40 stitches total. Then, work in stockinette for one more inch and bind off. 4. 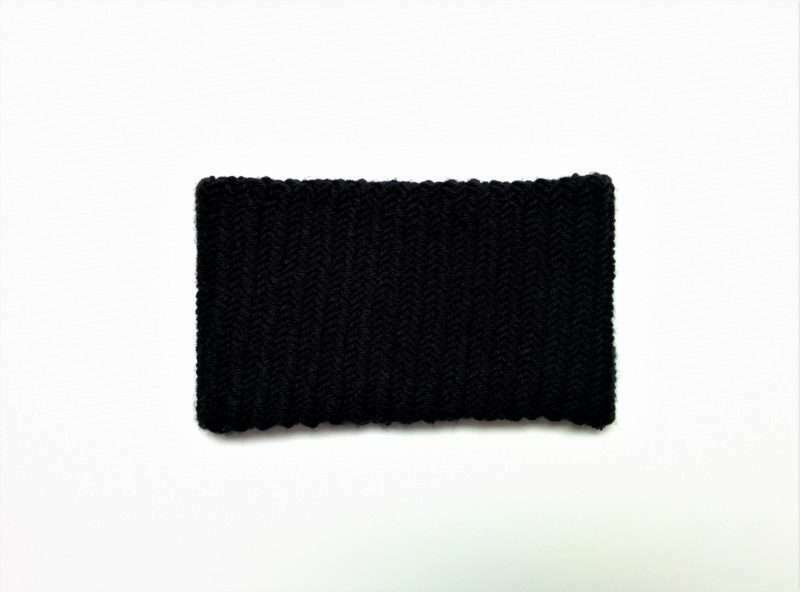 Using black yarn embroider a rectangle with rounded edges for the nose and a smile coming from it. Trim the yarn and weave in any loose ends. Great! 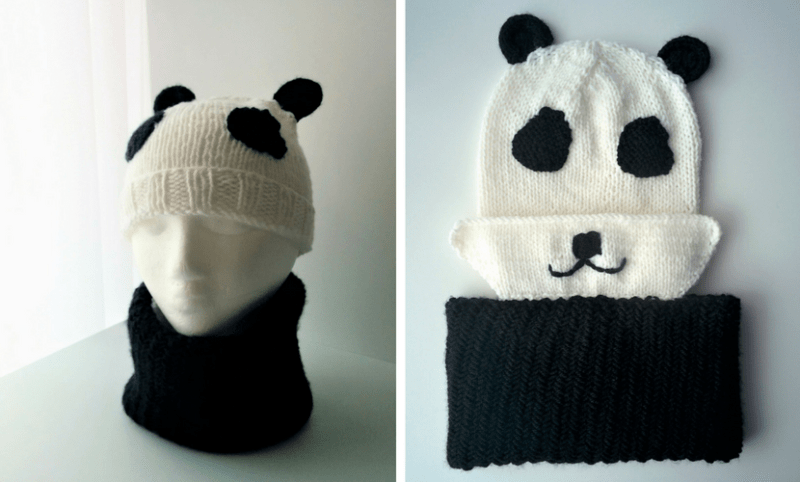 Now that you’ve made all the pieces, all that’s left to do is assemble everything to finish off the kids’ panda beanie and cowl. Start by sewing the shorter edge (the cast on edge) of the mouthpiece to the cowl. I intended this cowl to be worn doubled, so I just sewed the mouth along the top edge. It can be pulled up when my nephew wants to use it and tucked away when he doesn’t. Next, sew the ears onto the beanie. 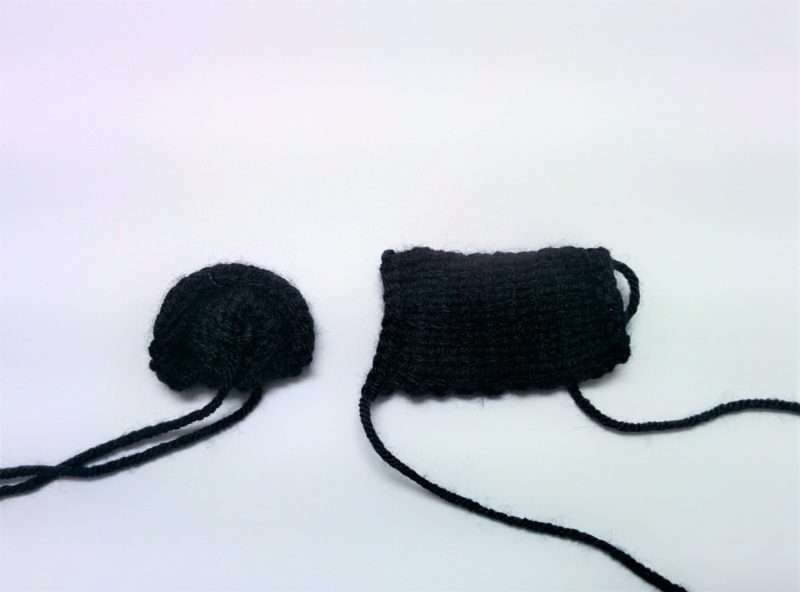 Because the decreases were done in four sections, the beanie should lay flat, with two decrease lines on either side. 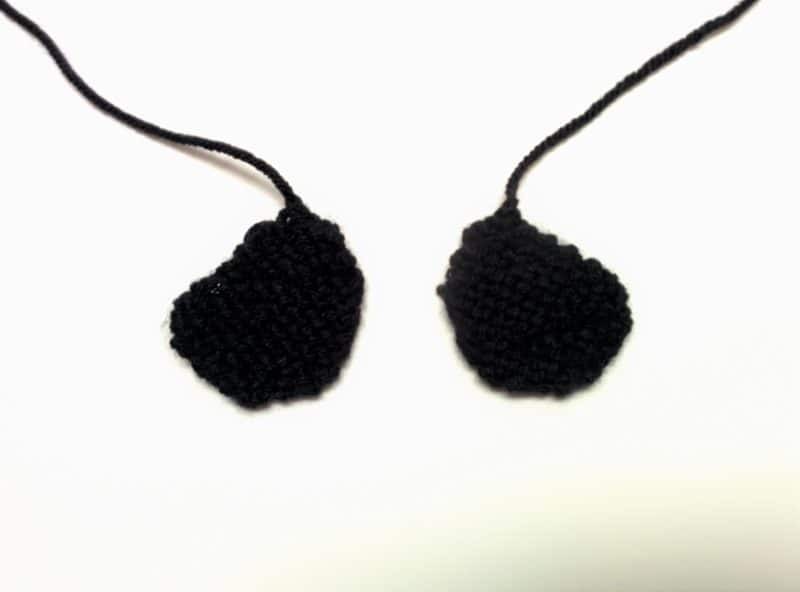 These make the perfect guide for sewing the ears onto! 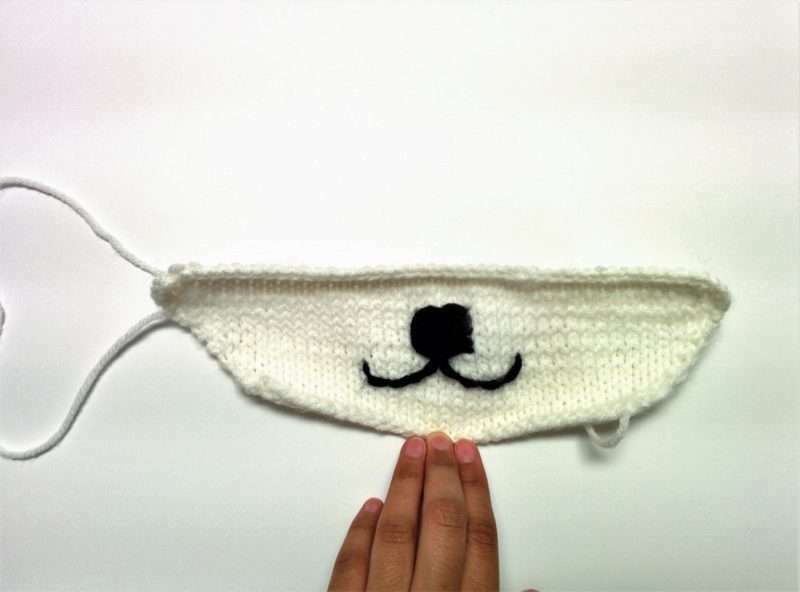 Lastly, sew on the eye patches to the front of the beanie and slightly higher than the center. Also, use a couple of snap buttons and sew them onto the sides of the mouthpiece and where they meet the cuff of the beanie. This last step is optional if you chose to do the mouthpiece at all, but it helps keep it in place while the hat’s in use. 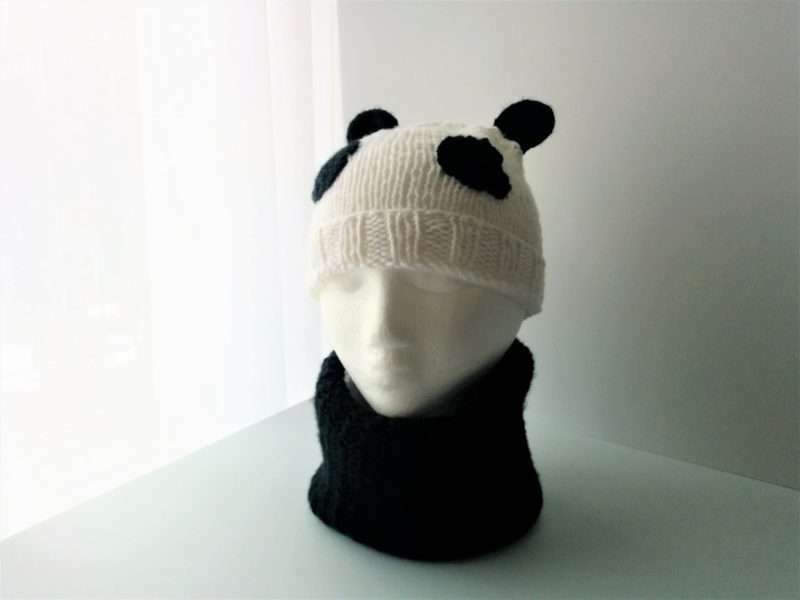 This beanie is super easy to make because it is just a basic white beanie with the features all added on in the end. What I love most about this though is the Herringbone Cowl. I have been obsessed with the look of herringbone stitch for a while and I just didn’t have any project I wanted to use it for. So it was really cool to learn this new stitch and have it turned out the way I wanted. I also got to use my big needles, which was fun! 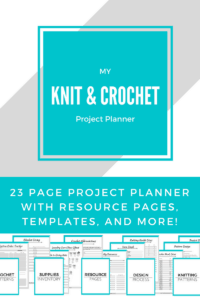 I’ll see you guys soon with a new pattern (one that goes reeeeaallly well with this blog theme 😉 ), so look out for that. 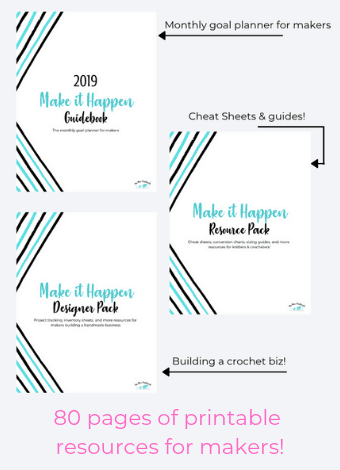 Subscribe down below or click the button above and you’ll get access to the resource library with bonus content just for subscribers. That includes the Ultimate Hat Sizing Guide!